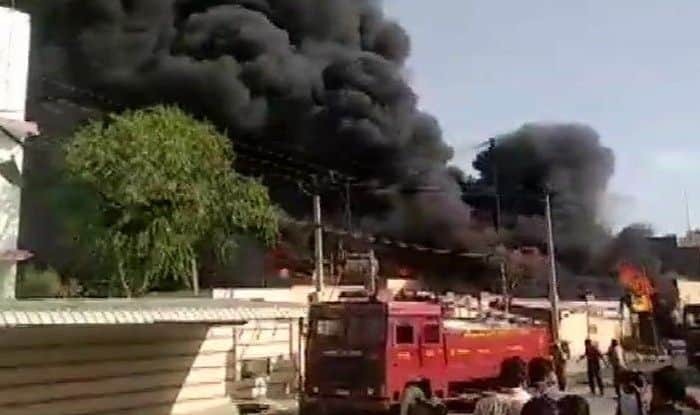 A fire broke out at a chemical factory in Basni Industrial Area in Rajasthan's Jodhpur on Saturday. Fire fighting operation is underway. Jodhpur: A fire broke out at a chemical factory in Basni Industrial Area in Rajasthan’s Jodhpur on Saturday. Fire fighting operation is underway. In another incident, a medium category fire broke out at a plastic goods godown at Burari in Delhi today evening. No casualties were reported. On March 26, a fire broke out at a thermocol factory located in the industrial area of Kasna in Udyog Vihar extension of Greater Noida. At least six fire tenders were rushed to the spot. No casualties were reported. A short circuit at the factory is said to be the likely reason behind this fire. The same day, at least two minors were charred to death in the fire that broke out at a furniture shop in Shaheen Bagh’s Abu Fazal Enclave in southeast Delhi. A six-year-old boy and seven-year-old girl died in the blaze, police said.